4.1904: Launched by Henry Reynolds, South Side Shipyard, Lowestoft for Robert Catchpole (64/64), Kessingland as RECORD. 25.5.1904: Registered at Lowestoft (LT360). Robert Catchpole designated managing owner. 22.12.1913: Sold to Jermyn T. Greengrass (64/64), Lowestoft. Jermyn T. Greengrass designated managing owner. 27.5.1918: Sold to John Victor Breech (64/64), Lowestoft. John Victor Breech designated managing owner. 30.12.1918: Sold to William Samuel Capps (21/63), George Gurney Hall (21/64) and John Victor Breach (22/64), Lowestoft. John Victor Breech designated managing owner. 6.4.1920: Sold to Goldthorpe, Scott & Wright Ltd, Grimsby. 26.4.1920: Lowestoft registry closed “No longer fishing”. 4.1920: Registered at Grimsby. Samuel L. Goldthorpe, New Cleethorpes designated manager. Employed running between Grimsby and Hull, parcels and general. 16.11.1922: Sold to Frederick Arthur Boards, Jesse Edwin Worth, Hull and Ernest William Little, Bridlington (64/64 joint owners). Ernest William Little, Bridlington designated managing owner. Grimsby registry closed. 4.12.1922: Sold to Record (Hull) Steam Fishing Co Ltd. Hull (64/64). Grimsby registry closed. 29.12.1922: Ernest William Little, Bridlington designated manager. 19.1.1923: Re-measured 71.18g 33.74n as per Board of Trade Survey at Hull dated 15.1.1923. 28.1.1923: Registered at Hull (H777). 15.2.1923: Re-measured 27.86n as per Board of Trade Survey at Hull dated 13.2.1923. 24.9.1924: Sold to Frank Andrew Peterson (64/64), Grimsby. 6.10.1924: Peter M. Peterson, Hessle designated manager. 12.2.1925: Vessel mortgaged (64/64) to National Provincial Bank Ltd, London (A). 1928: Seasonal fishing out of Fleetwood. 25.5.1928: Typical landing 18 boxes. 6.6.1928: Typical landing 15 boxes. 20.7.1929: Sold to Basil Arthur Parkes (64/64), Blackpool. 30.7.1929: Basil Arthur Parkes designated managing owner. 10.1930: Sold to French principals. 8.10.1930: Hull registry closed “ Sold foreign – French principals ”. 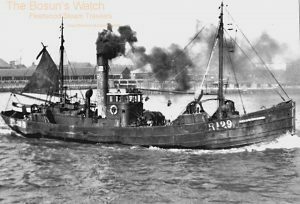 This entry was posted in Drifter/Trawler, Seasonal Visitors, Steam Trawlers on March 5, 2019 by Fred Smith. 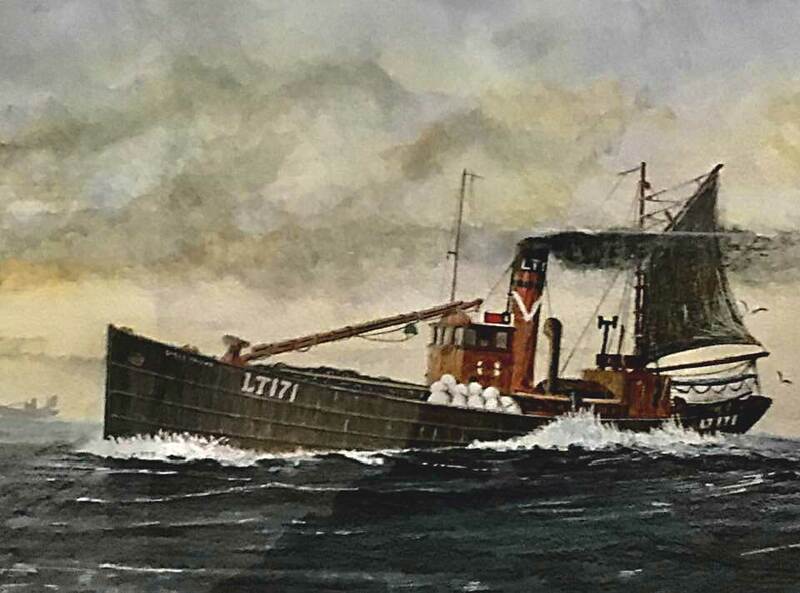 10.1918: Launched by John Lewis & Sons Ltd, Torry, Aberdeen (Yd.No.64) (“Admiralty drifter”) for The Admiralty as MURK. 11.11.1918; Completed as a minesweeper (Ad.No.3925). 10.1920: Transferred to Ministry of Agriculture & Fisheries, London. 1921: Sold to A. G. Roe, Ramsgate. Fitted for trawling. 25.11.1921: Registered at Ramsgate (Part I & IV) as MURK O.N.137721 (R345). 1922: Sold to Colis Durrant, Lowestoft. 12.7.1922: Registered at Lowestoft (LT171). Colis Durrant designated managing owner. 2.8.1922: Registered at Lowestoft as GIRLS FRIEND (LT171) (RGS M 25244). c3.1928: Seasonal white fish trawling out of Fleetwood. 31.5.1928: Typical landing 30 boxes. 22.6.1928: Returned to Fleetwood to to pick up new fishing gear having come fast when fishing off the Kish Bank, Co. Dublin coast. Efforts to free the trawl failed when the trawl warps parted and the gear valued at about £80 was lost. 1930s: Seasonal white fish trawling out of Padstow & Fleetwood. 1937: Sold to A. Duthie, Peterhead. 21.4.1937: Registered at Peterhead (PD243). 9.6.1937: Registered at Peterhead as TRUST (PD243). John Duthie Jnr designated managing owner. 1939: Ownership transferred to Representatives of John Duthie Jnr, Peterhead. 9.11.1939: Requisitioned for war service on transport duties (Hire rate £32.0.0d/month). 11.1940: Employed as an A/S drifter. 1941: Sold to Alexander Hay & others, Aberdeen. 1954: Sold to William Strachan, Peterhead. 4.1954: Broken up. Peterhead registry closed. This entry was posted in Drifter/Trawler, Steam Trawlers, Steamers (Picture) on February 8, 2019 by Fred Smith. 26.8.1911: Launched by Cochrane Shipbuilders Ltd, Selby (Yd.No.494) for John Mitchell, Kessingland and R. Sillett, Lowestoft as PARAMOUNT. 24.5.1911: Registered at Lowestoft (LT1116). 25.5.1911: Completed. John Mitchell c/o Mitchell Bros, Lowestoft designated managing owner. 12.1914: Requisitioned for war service as a patrol boat and later minesweeper (1-6pdr HA) (Ad.No.1295). Based Ramsgate (Sk. Herbert W. McNeil RNR). 11.1916: With drifter PRESENT HELP (Ad.No.0 (LT1120) took into Ramsgate for examination a schooner which was proceeding up channel to the east of the Goodwins, onboard thirteen German Army officers and non-commissioned officers who had been fighting in the Camaroons. C1916: Sk. 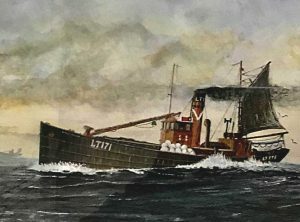 E. Hemp RNR appointed CO.
18.3.1917: Four German destroyers shelled Margate, torpedoed and sank the Hull registered steamer GREYPOINT (894grt/1889) at anchor off Broadstairs, shelled Ramsgate and drifters, hitting PARAMOUNT in several places and severely injuring the skipper and two hands. 10.1917 – 3.1919: Employed as a minesweeper with ASM137. 24.11.1917: In the English Channel off Ramsgate, U.boat (U48) (Kapitanleutnant Karl Edeling) fouled the A/S nets laid to the north of the Goodwins and at about 3.00am. drifted onto the bank. The U.boat was lightened in anticipation of refloating. At daybreak leaving Ramsgate in company with the drifters MAJESTY (Ad.No.1292) (LT66) and PRESENT HELP, proceeding north sighted the stationary U-boat. Closing, they opened fire with their 6pdrs and the fire was returned by the U48 with her superior weaponry, inflicting some damage to PRESENT HELP. They were joined by drifters ACCEPTABLE (Ad.No.1290) (LT1291) FEASIBLE (Ad.No.221) (LT1191) and LORD CLAUD HAMILTON (Ad.No.) (LT1047 ) and the destroyer HMS GYPSY (‘C’ class) which engaged the U48 with her 12pdr scoring thirteen hits. The encounter was brief and escape impossible, Kapitanleutnant Edeling ordered timed scuttling charges to be placed fore and aft and surrendered. The U-boat blew up and with 19 dead including the CO, the 17 survivors were landed at Ramsgate. Post 12.3.1919: Returned to owner at Lowestoft. 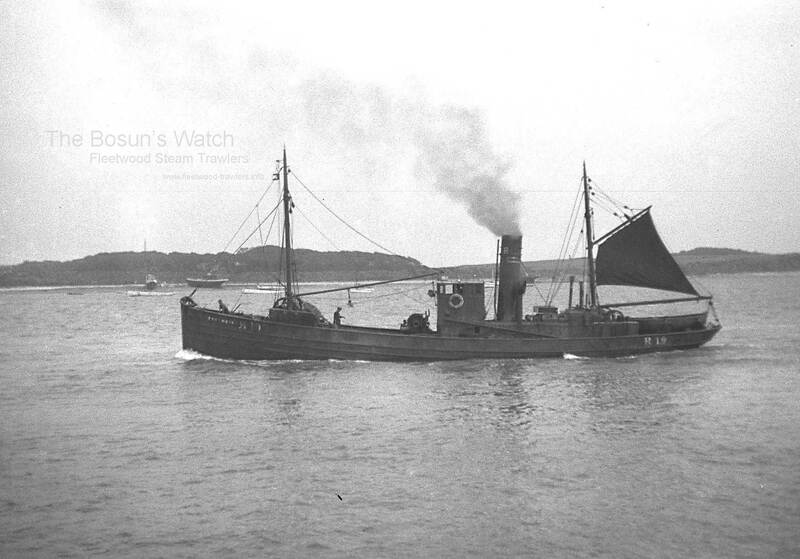 21.2.1920: Sold to Ramsgate Steam Trawling Co Ltd, Ramsgate. 3.1920: Registered at Ramsgate (R193). Thomas W. Chapman designated manager. 15.4.1921: Entered Ramsgate with a live mine onboard, picked up in the trawl. Not allowed to proceed “through the bridge”, mine removed by coastguard and naval party and rendered safe. 1922 – 1928: Seasonal white fish trawling out of Milford and Fleetwood. 24.11.1924: Fishing off the French coast in the neighbourhood of Sangatte (Sk. Fred Setterfield); at Ramsgate landed 30 trunks of turbot valued at £750. Such a catch had never before been recorded at the port. 21.12.1925: Returned to Ramsgate at 2.00pm to land the cook, Robert Pedder who had been struck by the trawl warp when fishing the Sandette bank grounds. When the vessel was turning, Pedder was struck in the face inflicting a severe scalp wound. Charles Setterfield, son of the skipper, who holds a first aid certificate, was able to treat the injury and make him comfortable. At hospital the wound was stitched and Mr Pedder taken home. 26.10.1926: After fishing “The Falls” returned to Ramsgate with a good shot of herring and thirty sharks, caught in the nets when chasing the herring. 6.11.1926: Reported that Louis Martin, night watchman, saved the life of skipper Fred Setterfield when he fell into deep water in Ramsgate Harbour, holding him up until help arrived. 31.3.1927: At Fleetwood, loading a drum of carbide into the generator in the engine room, overflowed and fell into a pool of water on the plates. A large volume of gas was emitted and ignited by the stove and on reaching the drum, exploded. William Stone, deckhand who was cleaning the cabin was thrown violently against the side and was cut about the head. The deck of the cabin was torn up and dense smoke enveloped the ship. The alarm was raised and the fire was quickly extinguished by the Dock Fire Brigade. 19.7.1927: At Ramsgate landed a 144lb sturgeon. Auctioned on the market it made £3.14s and was displayed before being sent to London. 30.12.1927: Sailed Ramsgate for a trip at the back of the Goodwins (Sk. Fred Setterfield). 2.1.1928: Returning to Ramsgate in the early hours around high water, in a strong SSW wind and heavy sea, stranded on sandbank alongside East Pier, Ramsgate when there was a problem in the engineroom. Five members of the crew including the skipper were taken off by the Ramsgate lifeboat Prudential (Cox. T. Read) while three other crewmen climbed the mainmast and were pulled to safety on the pier. Ch Eng. William Surman (38) who was badly scalded by an explosion in the engine room was taken to hospital and detained. Later the body of Harry Often (26), 2nd Eng. was washed ashore on Ramsgate sands. At low water, Ramsgate Fire Brigade de-watered the ship and 200 boxes of fish were recovered. Subsequently refloated and taken in to the harbour for survey and repair. 12.3.1928: On the afternoon tide, sailed for “the West’ard” (Padstow, Milford and Fleetwood) (Sk. Fred Setterfield) after repair and refurbishment following the January incident. 1928-1939: Seasonal white fish trawling out of Padstow, Milford and Fleetwood. Harry Eastoe Rees, Milford managing agent. 31.11.1928: Off Ramsgate, Arthur Medhurst (26), Third hand, fell overboard and drowned. 1932: Alfred H. Lanfear Jnr designated manager. 16. 2.1935: Arrived Milford with drifter/trawler MILL o’ BUCKIE (R129) in tow. MILL o’ BUCKIE had been driven ashore in a strong gale in late January on the west side of Rosslare Harbour, Co Waterford, resting on hard ground with two blades of propeller partially broken and leaking in the stokehold. After salvage, hired to tow her back to Milford for temporary repairs prior to returning to Ramsgate. 24.11.1938: Put into Dover with a leaking boiler tube. 15.11.1939: Requisitioned for war service as a minesweeping drifter (P.No.FY954) (Hire rate £25.10.0d/month). 12.1939 – 2.1940: Fitting out as a minesweeper, Swansea Command (Sk. E.C.E. Blowers RNR). 21.1.1940: Took off crew, sixty in number – twenty injured, of Liverpool registered steamer PROTESILAUS (9577grt/1910) (Alfred Henry Dennistoun Shand, Master), Liverpool for Barry in ballast, which had been mined at 9.36am about six miles WSW of Mumbles Head, Bristol Channel (mines laid off Rotherslade 5.12.1939 by U.boat (U28)). Survivors landed at Swansea and vessel towed into Swansea Bay and beached off Mumbles Light House. Later broke in two. 10.1941 – 3.1942: Refitting at Gloucester. From 2.1942: Sk. C. E. Blowers RNR, CO.
16.12.1943: Sk. Frederick William White RNR, CO.
2.1944 – 3.1944: Listed as Special Service Vessel, Milford Command (but still at Swansea). 4.1944 – 3.1945: Plymouth Command. 4. – 8.1944: Listed at Milford. 9.1944 – 2.1945: Listed at Portsmouth. 4.1945 – 9.1945: Portsmouth Command. 1945: Sold to Harry Eastoe Rees, Milford Haven. 1945: Sold to Drifter Trawlers Ltd, Milford Haven. Harry Eastoe Rees designated manager. 19.1.1946: Returned to owners at Milford Haven. 2.1946 – 5.1949: Fishing out of Ramsgate. 12.1946: Entered Ramsgate with a live mine onboard, picked up in the trawl. 07.1950: Laid up at Milford Haven. 1955: Sold to Rees Shipbreaking Co Ltd, Llanelli for breaking up. 3.8.1955: Sailed Milford for Llanelli under own power. 8.1955: Ramsgate registry closed. 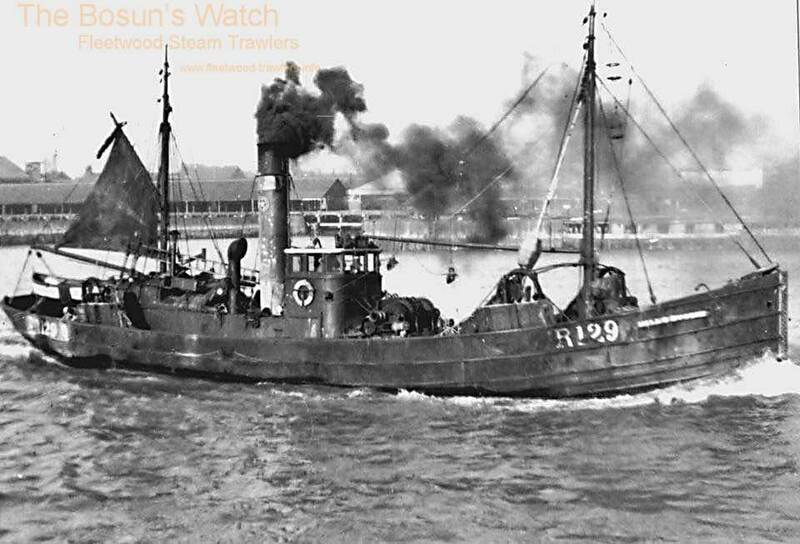 Last Ramsgate registered steam trawler. This entry was posted in Drifter/Trawler, Non Fleetwood Vessels, Steam Trawlers, Steamers (Picture) on July 2, 2018 by Fred Smith. 1919: Launched by John Chambers & Co Ltd, Oulton Broad, Lowestoft (Yd.No.500) (“Admiralty drifter”) for The Admiralty as DISTANCE (Ad.No.4149). 20.1.1920: Completed as a fishing vessel. 1920: Transferred to Ministry of Agriculture & Fisheries, London and placed on sales list. 8.1920: Sold to Robert Boyle, North Shields. 26.8.1920: Registered at North Shields as LEONARD BOYLE (SN45). Robert Boyle designated managing owner. 1926: Sold to James R. Duthie, Andrew Duthie, Archibald Ritchie, Rosehearty; Alex Duthie, Andrew Duthie, Glasgow; Gilbert Peterkin, Richard Irvin & Sons Ltd, Fraserburgh. 28.4.1926: North Shields registry closed. 30.4.1926: Registered at Fraserburgh as DUNDARG (FR212). James R. Duthie, Rosehearty designated managing owner. 1938: Sold to Jane A. Duthie, Rosehearty. 1938: Sold to M. C. Lough & George Lough, Eyemouth. Fraserburgh registry closed. Registered at Berwick as EXCEL IV (BK260). James Lough designated managing owner. 3.10.1939: Requisitioned for war service and employed on port duties. (Hire rate £32.0.0d/month). 6.1940: Employed on transport duties. 8.1940: Based Kirkwall. Employed on miscellaneous naval duties. 7.1942: Based Anstruther. Employed on torpedo recovery and as a boom tender. 1945: Sold to Jackora Ltd, Lowestoft. 7.2.1946: Registered at Lowestoft (LT171). Arthur C. Mitchell, Milford Haven appointed manager. 1950: Seasonal white fish trawling from Fleetwood. 13.4.1950: Best landing – 83 boxes £550 gross. 1955: Sold to Belgian shipbreakers. 22.5.1955: Sailed Lowestoft for Antwerp (Sk. Gowan) towing steam drifter JACKORA (LT129) also for breaking. This entry was posted in Drifter/Trawler, Steam Trawlers and tagged Admiralty Drifter, Drifter/Trawler, No Fleetwood owners on November 27, 2015 by Fred Smith. 1906: Launched by Henry Reynolds & Co, Southside, Lowestoft (Yd.No.?) for William Thomas Tripp (16/64), Kessingland; Alfred Strowger (16/64), Kessingland; May Beatrice Stuart (16/64), London; Robert Stuart (12/64), Cirencester; Ruth Stuart (4/64), Cirencester as PROSIT. 9.5.1906: Registered at Lowestoft (LT232). William Thomas Tripp designated managing owner. 16.6.1906: Robert Stuart sold (4/64) shares to Mary Stuart (4/64), Edinburgh. 20.6.1906: Registered to William Thomas Tripp (16/64); Alfred Strowger (16/64); May Beatrice Stuart (16/64); Robert Stuart (8/64); Ruth Stuart (4/64) and Mary Stuart (4/64). 15.3.1910: May Beatrice Stuart sold (8/64) shares; Mary Stuart sold (4/64) shares; Robert Stuart sold (4/64) shares to Alfred Strowger (32/64). Registered to Alfred Strowger (32/64); William Thomas Tripp (16/64); May Beatrice Stuart (8/64); Ruth Stuart (4/64) and Robert Stuart (4/64). 12.4.1911: Ruth Stuart sold (4/64) shares and Robert Stuart sold (4/64) shares to Alfred Strowger (40/64). 20.4.1911: Registered to Alfred Strowger (40/64); William Thomas Tripp (16/64) and May Beatrice Stuart (8/64). Alfred Strowger designated managing owner. 28.2.1912: William Thomas Tripp sold (16/64) shares and May Beatrice Stuart sold (8/64) shares to Alfred Strowger (64/64), Kessingland. 16.3.1912: Registered to Alfred Strowger (64/64), Kessingland. 1.1915: Requisitioned for war service as an A/S net drifter (1-3pdr) (Ad.No.1039). Later employed as a minesweeper/patrol based Buncrana, Co. Donegal (1-6pdr). 7.5.1929: Sold to Honora Evelyn Parkes (64/64), Blackpool. 5.1929: Fred Parkes, Fleetwood & Blackpool appointed manager. 7.1929: Sold to French subjects. This entry was posted in Drifter/Trawler and tagged Parkes, Wooden Drifter on June 2, 2014 by Fred Smith.